DATE: c.1880. No Tower Bridge, construction started in 1886. So best guess for map: 1880. PUBLISHED BY: W.H. Smith & Son Ltd. AREA: LONDON. EDITION: Large Scale plan. 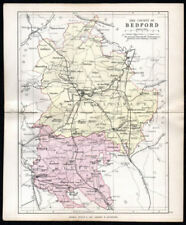 Stanfords Map of. 1897 Edition. Central London. Fold Out Map. 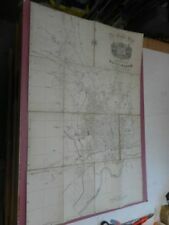 A beautiful original antique folding map of London in very good condition and suitable for framing. MANCHESTER, SALFORD & ENVIRONS. A 19th Century hand coloured lithograph on paper, 27 x 35 cm overall. To anyone who lives in Hastings, these make fascinating viewing, revealing vast areas that have now been built on. But these are wonderful examples, with fabulous handcolouring, and overall a clean impression. Who was William Mavor?. William Fordyce Mavor (1758–1837) was a prolific author and a clergyman. He wrote mainly educational books, on subjects such as history, botany and pedagogy, and he also developed a system of shorthand. C.1895 "The Pictorial Plan of London" by Thomas Sulman (c.1834 - 1900), Published by Joseph Smith. Undated, the plan shows the principal buildings of historical interest, including Tower Bridge which it notes "Opened in 1894". The station is shown, and Wellington Square too.To anyone who lives in Hastings, these make fascinating viewing, revealing vast areas that have now been built on. One or two have later annotations in pencil (see photos0 which could be removed but are of interest in themselves. ). Map is a cloth-backed version of the Plan de Paris et ses Fortifications originally published by Auguste Logerot around 1844. Coverage extends out to St Denis, Bois de Vincennes and beyond the western bend in the Seine to show a number of military forts, also marked in colour. Thank you for looking at this Original Antique Map Date: 1883 I make a lot of effort to try and get the age of an item as close as possible. If you feel that I have the age of an item wrong please let me know before purchase. Size: see photos Condition: good for its age I provide quality photographs and these should studied as they form part of the description. Verso: Your map is blank on the reverse. Notes: All our Photographs / Postcards / Ephemera / Maps are original we do not deal in copies or reproductions We are collectors and lovers of old Books, Prints, photographs, postcards and ephemera not just traders. Your item will be sent in a hardback envelope. We ship within one business day If you require any special requirements please contact to discuss For any issues or questions please contact us via eBay. GREENWOOD (CHRISTOPHER and JOHN) Map of London, from an Actual Survey Made in the Years 1824, 1825, & 1826. 1827 / 49.8" x 73.0" (126.5 x 185.5 cm). Dissected and laid onto linen. Thank you for looking at this Original Antique Map Date: 1889 I make a lot of effort to try and get the age of an item as close as possible. If you feel that I have the age of an item wrong please let me know before purchase. Size: see photos Condition: good for its age I provide quality photographs and these should studied as they form part of the description. Verso: Your map is blank on the reverse. Notes: All our Photographs / Postcards / Ephemera / Maps are original we do not deal in copies or reproductions We are collectors and lovers of old Books, Prints, photographs, postcards and ephemera not just traders. Your item will be sent in a hardback envelope. We ship within one business day If you require any special requirements please contact to discuss For any issues or questions please contact us via eBay. PRINTED FOR KELLY'S BY CHAS GOATER OF NOTTINGHAN. MAYBE VICTORIAN. A VERY INTERESTING PLAN WELL PRINTED. A LARGE FOLDED PAPER MAP LAID ON A LATER LINEN. Thank you for looking at this item Date: 1885 Size: please see my photos. Condition: I provide quality photographs and these should studied as they form part of the description. Verso: Your map is blank on the reverse Notes:. Undated, but possibly from the late Victorian era c1895. Small size 21.5cm x 17.5cm inclusive of the outer border. Paper lightly toned. Fine (F) : Should have no flaws, a perfect copy of a used book. Thank you for looking at this item Date: 1885 Size: please see my photos. Condition: I provide quality photographs and these should studied as they form part of the description. Verso: Your map has another map on the reverse Notes:. Undated, but possibly from the late Victorian era c1895. Small size 21.5cm x 17.5cm inclusive of the outer border. Paper lightly toned. May have small flaws, and has probably been read, but should appear overall clean and attractive. 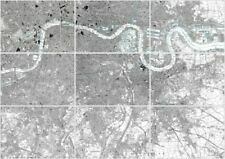 New map of the Environs of London. From the new Ordnance Survey. c1870 Mounted on Hessian folded into a hard case in colour. 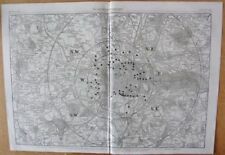 Antique illustrated map of Birmingham by J Rapkin 1851, original, framed. Rapkin worked in close association with the equally respected publisher John Tallis. By John Rapkin. Drawn & engraved by John Rapkin for "Tallis's Illustrated Atlas". Rapkin's superb illustrated town plans are only included in a minority of the Tallis atlases and are consequently quite scarce and highly sought after. 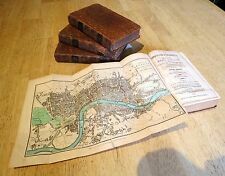 This is an original antique c.1880s folding map of London, England issued by G. W. Bacon and Co. Ltd, 127 Strand, London. This map folds open to about 37” x 28” and is contained within the original hardcovers which read in part. The Map: A Scarce and quite extraordinary copy of this large scale map of Paris is a full (64" x 42.5"). It's a Birdseyeview of the French Capital at the end of the Second Empire, on the eve of the Siege of Paris and the Paris Commune.